WASHINGTON, DC – American Farmland Trust, the organization behind the national movement No Farms No Food®, announces new commitments to combatting climate change, including hiring Jennifer Moore-Kucera as the new director of its climate initiative and simultaneously announcing its commitment to support the US Climate Alliance’s Natural and Working Lands Challenge and the Global Soil Health Challenge by California and France. Moore-Kucera will direct strategy, provide leadership and support program activities for AFT’s “Farmers Combat Climate Change” initiative. 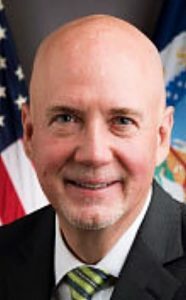 With Moore-Kucera’s leadership, AFT will support states in the US Climate Alliance in developing policies and programs to increase carbon sequestration and reduce GHG on farmland and ranchland to ensure agriculture realizes its potential as an essential element of state plans to combat climate change by 2020. “America’s farmers and farmland will play critical roles in our society’s response to combatting climate change. Today, American Farmland Trust is renewing our commitment to supporting farmers in responding to climate change with our hiring of a new climate director and our public commitment to supporting the Natural and Working Lands Challenge and the Global Soil Health Challenge,” said John Piotti, AFT president and CEO. Moore-Kucera’s lead on “Farmers Combat Climate Change” will be critical to its success. The initiative supports farmers and ranchers in adopting climate-smart farming practices on land they own and rent, encourages smart growth and protecting farmland to reduce transportation emissions and expands renewable energy siting while protecting our nation’s most productive, versatile and resilient farmland. Moore-Kucera is a renowned soil health expert — researcher, educator and presenter — on soil’s links to carbon sequestration. She brings to AFT her experience as the West Region Soil Health team lead for the USDA-Natural Resources Conservation Service Soil Health Division as well as serving as co-director/Natural Resource Conservation Service liaison for the USDA-Northwest Climate Hub. “Jennifer’s extensive technical and research expertise in soil health management and carbon sequestration practices will help farmers mitigate climate change while increasing crop yield, product quality and overall soil health,” said John Piotti. Moore-Kucera will be based in Corvallis, Ore., where she enjoys trail running, skiing, baking and camping with her family. She received her bachelor of arts in biology and environmental studies from Binghamton University, her master of science in soil science from Iowa State University and was awarded a doctorate in soil science from Oregon State University. She was elected to serve as the 2017 Chair of Soil Biology and Biochemistry Division of the Soil Science Society of America and currently is an adjunct faculty member with the Department of Crop and Soil Science at Oregon State University. “I am very excited to be joining American Farmland Trust and look forward to helping accelerate the adoption of conservation practices and policies that will promote soil health, productivity, and resiliency. The goals and strategies outlined in the Farmers Combat Climate Change Initiative will play a critical role in helping farmers, ranchers, and urban growth planners develop and implement practices that can reduce greenhouse emissions, sequester C, and will help mitigate, if not begin to reverse the negative impacts predicted by climate change models,” said Jennifer Moore-Kucera. She continued, “At the forefront of this mission is to protect our productive lands and make them as resilient as possible. In combination with implementation of conservation practices and supportive policies, this holistic approach ensures our future with clean air, water and soil and high yielding, healthy food and fiber for our growing populations.